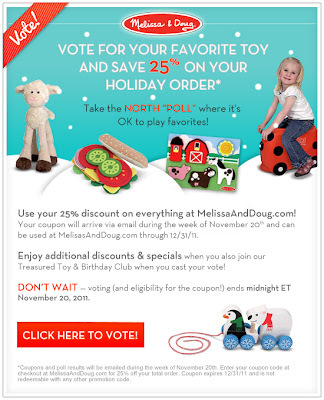 Eco-Babyz: Get a Melissa & Doug 25% Off Coupon When You Take the North "Poll"
Just in time for holiday shopping I have a great deal for you, how would you like to get 25% off Melissa & Doug toys? Melissa & Doug want you to tell them which of their educational toys you think is the best! Just click on the image below to place your vote in the North "Poll!" You'll Get a Melissa & Doug 25% Off Coupon** to use at MelissaAndDoug.com just for voting! That's a pretty generous offer. Plus if you spend more than $60 you get free shipping with code FREESHIP60. 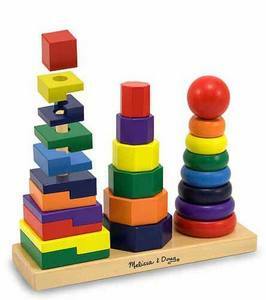 One of our favorites that my toddler has had for a couple of years is the wooden Geometric Stacker pictured above. Simple, classic, and timeless. Kept my toddler occupied while on the potty! They have many non-toxic wooden toys that we've come to love. 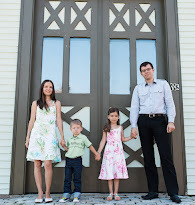 Disclaimer: By sharing this deal with you I am eligible to receive a blogger gift code from Melissa & Doug.